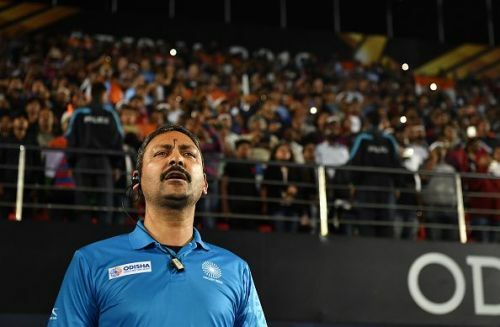 Standing on the verge of creating history, Indian hockey coach Harendra Singh said his team is ready to take on any challenge thrown by the Netherlands and answer the call of "1.3 billion" Indians in the 2018 Hockey World Cup quarterfinal here. World no. 5 India are set to take on World no. 4 Netherlands in the last quarterfinal here on Thursday, and Harendra said they have left no stones unturned and their preparation for the crucial clash are spot on. "Hoga to wahi jo hum chahenge (Eventually, it is what we want that is going to happen)," Harendra declared when asked about Thursday's vital encounter. "We want what 1.3 billion people want. Indian team is mentally and physically ready. We have done our homework on Dutch aggression. Whatever challenge they throw, we are ready to solve that, not just accept it," he added. India has never defeated Netherlands in the history of the World Cup, but Harendra refused to dwell on the past. "History is only to read, not to understand," he quipped. "They (Netherlands) have come prepared, Every team comes to win. Indian team has made history in the last six months. You have to face every team, it is World cup. You are bound to play the top team," he added. Harendra said it will be an equal contest on Thursday and whoever takes their chances will come out winners. "We won't do anything different. There are some minor adjustments. They love to play attacking hockey, so do India. It is an equal contest. In tomorrow's match, you can't afford to miss even 25 per cent chances," he said. Harendra said penalty corner conversions is an area of concern for the Netherlands which they will try to explore. "When we analyse a match, we study grey areas of the opponents. Penalty corners is their grey area. We don't ignore Holland outright. From 1971 to 2018, their base of hockey is penalty corners. We can't ignore that. India is ready to solve that challenge," he said. It is expected to be a full house on Thursday at the Kalinga Stadium like any other India match, and Harendra said "crowd support" will provide India extra motivation to go for the kill. "I think they are forgetting that whenever the crowd is behind us, it becomes 12th man, extra energy. As a coach I like that," he said. "There is no chance that opponents can easily sit on their back. I think it's not pressure, it's your thought how you enjoy it. So far in any tournament, not just the World Cup, we have learnt how to go with the crowd. We are enjoying." Harendra said India cannot afford to drop their intensity at any point of time during the match. "I agree that we have dropped our intensity during the course of a game, which we cannot afford against a team like Holland," he said. "I have told them to keep that intensity not just for 60 minutes but 74 minutes, including half-time and quarter-breaks. We have discussed and they have agreed." India captain Manpreet Singh said they are determined to create a history. "If you talk about Olympics it was two years ago. The team has improved, especially since Harry sir (Harendra) has come. We are playing attacking hockey. We want to change history. The focus is that we don't leave out even the 50:50 chances.